encore: Baby's First Birthday - My First Fondant Covered Cake! Baby's First Birthday - My First Fondant Covered Cake! My friend and co-worker, Belit, asked me to bake a cake for her daughter Bella's first birthday. She gave me creative license and I knew I wanted to make something special. As luck would have it I had a Wilton class the night before I had to bring her cake to her. In that class, we learned to cover a cake in fondant. So, I decided on a design, which was actually inspired by a cake I found on Flickr. It was a cake made for a wedding shower by Pink Cake Box, of which Anne Heap is the founder. She is a graduate of the Pastry Arts Program at the French Culinary Institute in New York City and completed an apprenticeship with Ron Ben-Israel Cakes in New York City (OMG!). She is a spectacular cake artist. You can click here to see the cake that inspired me. I covered my cake in class with fondant colored a very pale shade of pink. But, instead of adding all the other stuff that was included in the class curriculum, I waited until I got home to decorate it. I colored gumpaste in a shade slightly darker than the fondant on the cake, then I made an even darker color, adding a little orange to it so that it was sort of a shrimp color. I used a daisy cutter to make gerbera daisies and then rolled bright green stems and tendrils. I used a darker shade of green to make the centers of teh flowers. Then I used a small round cutter to cut circles from white fondant. I rolled two circles together to form a pearl and did this until I had surrounded the entire cake. I then brushed the pearls with pearl white shimmer dust for a finishing touch. Since fondant isn't "mushy" I decided Bella needed a "smash cake" that she could dig into. So I cut a small circle out of cardboard and covered it in silver paper. Then I used a biscuit cutter to cut the center out of an extra cake. 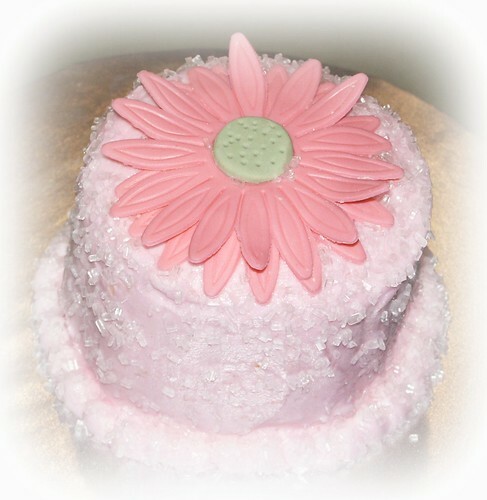 I frosted it in pink buttercream and covered the entire cake in pink sugar crystals. I finished it with a gerbera daisy on top. Belit was ecstatic when she saw the cake and I was thrilled that I could deliver two cakes to her that I was quite proud of. This was Bella's little smash cake. Kim, this is your FIRST fondant cake??? Incredible and so adorable!! Yep! Thanks! It was for the Wilton Fondant & Gum Paste class I was taking. I deviated from the curriculum because I needed a birthday cake for my coworker's baby girl and had to deliver it the next day. 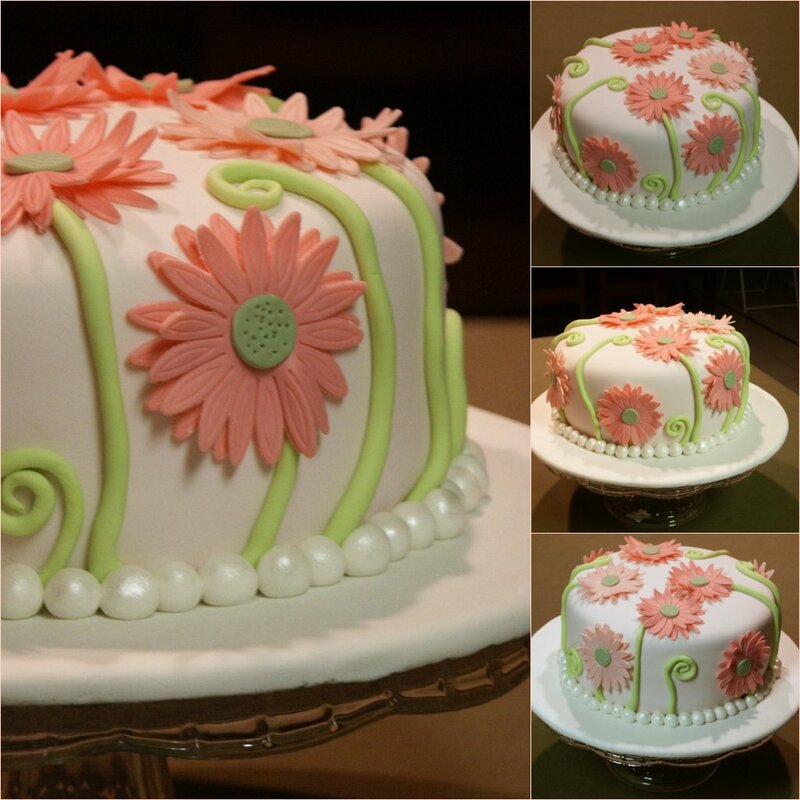 My instructor showed me how to use the daisy cutter and I went home and worked on that cake until 1:30 a.m. But I was quite pleased with the results!